If your school system is typical, you simply don't have the resources or the time to provide anything but the most cursory training for substitute teachers. In many cases, you do a background check and provide subs with a booklet that explains basic policy and safety procedures. The problem is that many subs don't have a formal teaching background. How can you provide them with basic teacher training at low or no cost and in a rapid time frame? Substitute Teaching from A to Z can act as a "mentor" for every one of your subs. But to accomplish this, you have to get the book into their hands. One approach is to purchase Substitute Teaching from A to Z and provide a copy for each new substitute teacher as part of their preliminary workshop or training. The cost to your system is less than $15.00 per sub. The benefit is a teacher who understands how to control a classroom and provide solid teaching, rather than babysitting. 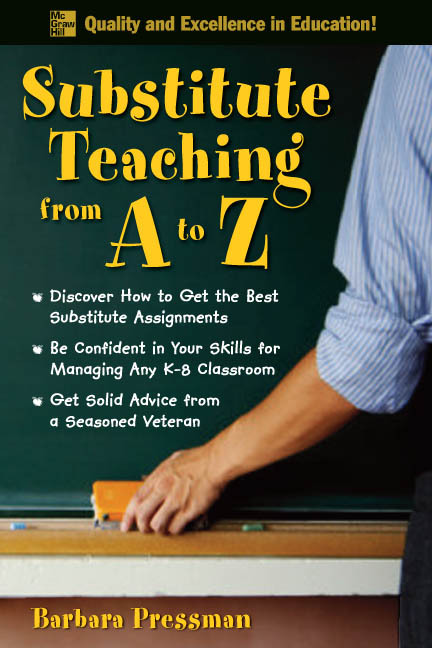 A different approach is to maintain an inventory of Substitute Teaching from A to Z, but have each prospective sub purchase his/her own copy. Many school systems already have their substitute teacher candidates pay for their own background checks, so the additional expense will not be prohibitive for them. This approach provides worthwhile "mentoring" at no cost to your school system. You can choose to provide each school in your system with a a few copies of Substitute Teaching from A to Z. The copies would be placed in the teacher resource center and would be made available to all subs who may have interest. Finally, as part of your substitute teacher preliminary workshop or training, you can provide a description of and pointers to Substitute Teaching from A to Z and online sources for its purchase. Some of the approaches that we've recommended will cost a few dollars, but the benefit of getting real teaching accomplished in a classroom covered by a substitute teacher is priceless.